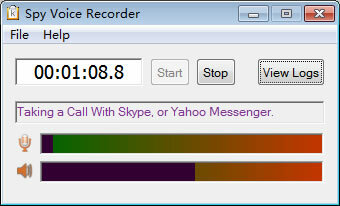 Spy Voice Recorder Instructions - Record Skype, Yahoo Messenger Voice Conversations Automatically. View Logs: Open the directory where the mp3 audio files. Off: The software does not start automatically with windows. On - Visible mode: The software will automatically run after computer boots; the main window will display on your desktop, and display a small software icon in the lower right corner of the screen. On - Invisible mode: The software will automatically start after computer boots; but the main window will not display at startup. You can see the software on the screen only by pressing the hotkey. Manual mode: You need to click the "Start" button on the software main window to start recording. 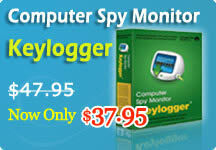 Record with Program Startup: start recording automatically when Spy Voice Recorder is opened. In the options, you need to set how many minutes each time to save the recording files. Save the voice only when any volume exceeds designated value: If you do not tick this option, Spy Voice Recorder will record every sound after it boots; sometimes we do not want the software to record when there is no/low sound around. Therefore, we have added this option in the software. For example, we set 25% in the back and the front shows to save files every five minutes. In this case, if there is any recorded volume exceeding 25%, these five minutes will be saved as a file (the color bar on top of the main screen displays the current volume of sound recorded by the microphone). 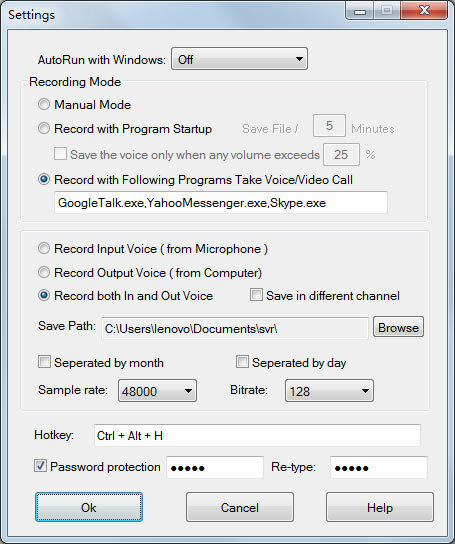 Record with Following Programs Take Voice/Video Call: You need to set at the bottom the process name of the software needed to be intercepted, as separated by commas. We have set up the default processes of Skype, Yahoo Messenger and GoogleTalk. If you need to set up other programs, you can add in the back, but remember to separate with a comma. Notice: Please don't copy extra space in the begin and end of process name. Record Input Voice ( from Microphone ): Only record the voice from microphone. Record Output Voice ( from Computer ): Only record the voice which is played from computer. Record both In and Out Voice: Spy Voice Recorder not only records audio input by the microphone, but also record sounds output from the computer. When recording voice conversations, generally you need to tick this option so as to record voices from both sides, otherwise it will only be able to record your own voice or the voice from other side. However, this option is not available in XP and earlier operating systems, and it is only applicable in Vista, Win7 and Win8 and the later new operating systems. In the old operating system, if you need to record voices from both sides, you can set by right clicking the volume icon in the operating system; please click here to read more details. Save in Different Channel: If you tick this option, voices input from the microphone and sounds from the computer will be saved in two different channels. If you record voice chats, when you play the recorded MP3 files, you will find your voice playing from a speaker, and another voice playing from another speaker, as if two people are talking from the left and right speakers. Save Path: Set the path of the mp3 files to be saved. Seperated by Month / Seperated by Day: When there are many audio files, saving them under the same folder makes it hard for people to seek for a specific file. If you tick either option, the audio files of the same month or the same day will be saved under the folders named by the current month or the current date. Sample rate / Bitrate: the larger the two values are, the clearly the sound is, and the larger space the files occupy. Hotkey: Hotkey to unhide Spy Voice Recorder. Password Protection: if you tick it, you will be asked to enter your password when opening the software by hotkeys or clicking the tray icon on the bottom right corner of the screen.